There’s a certain cycle to our eating habits that follows the seasons: In the summer, we tend to crave cool and crunchy salads. When it’s cold outside, salads fall by the way side in favor of warm, hearty foods. But with a few simple swaps, you can make winter salads something you’ll crave when the temperatures drop. Start by redefining your idea of a salad: It doesn’t have to be cold, and it doesn’t even have to include greens. You can add your favorite fall and winter ingredients to your salads to change up the flavors and texture — even the temperature. From winter squash and nuts to spices and whole grains, here are some unique ways to turn your salad into cold-weather comfort food. Roast delicata rings, butternut cubes and even pumpkin wedges to add to a salad. Toss with olive oil and warm spices like paprika and chili powder or cinnamon and ginger. Winter squash is a complex carb that’s a good source of vitamins A, C, and fiber. Tip: To cut back on fat in a salad dressing, use a few puréed cubes of cooked squash in place of half the oil. 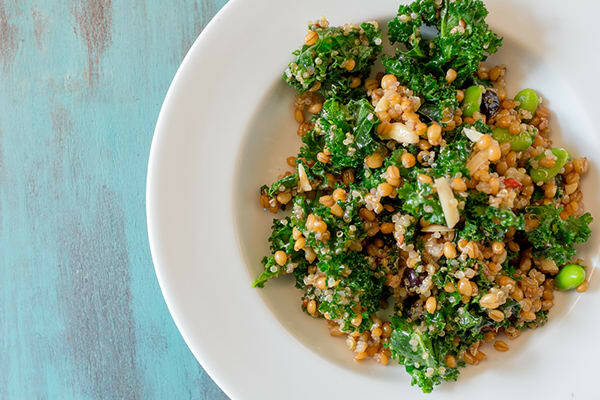 Cooked whole grains like quinoa, farro and brown rice can be the base for a hearty side or light main salad. Chewy and hefty, whole grains add fiber and important minerals like magnesium and selenium to your diet. Tip: Cook your grain of choice until just al dente (firm to the tooth) to avoid mushy salads. Mushrooms offer a rich meatiness for relatively few calories. Sauté them in olive oil with thyme and rosemary for a fragrant addition to a grain salad. Tip: Instead of white buttons, experiment with wild mushrooms like cremini, maitake, and shiitakes for added flavor, texture, and nutrition. Move over, kale. Your diminutive cousin is the cruciferous veggie of choice these days. Shaved Brussels sprouts can be massaged with fresh lemon juice and salt for a filling raw salad. Or sauté and toss them with thinly sliced red onion and a lemon-thyme vinaigrette. Tip: Buy them pre-shredded to save time or use your food processor’s slicing blade for even shreds. Winter doesn’t mean the end of delicious citrus. Many citrus fruits peak in winter, like grapefruit and oranges. 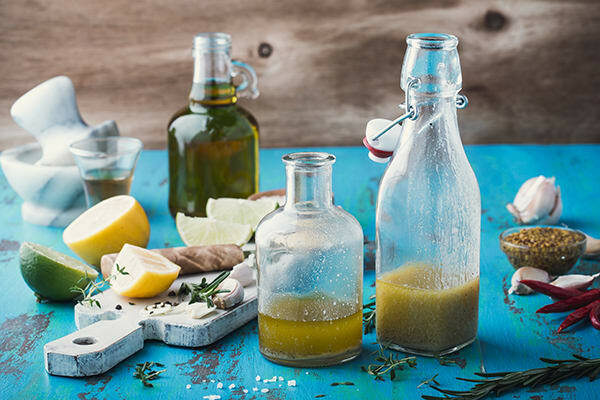 Lemon and lime juice can brighten salad dressings and break down tough greens, while orange and grapefruit segments lend a sweet-tartness to any salad. Try avocado, roasted beets, and walnuts with ruby red grapefruit. 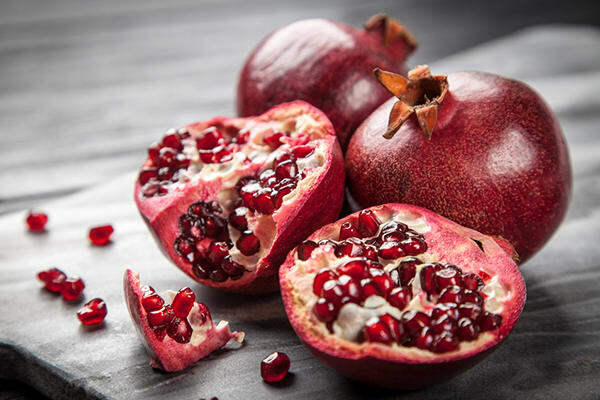 The season also means exotic fruits like pomegranates and persimmons, as well as the tasty standbys like pears and apples. Pomegranate arils burst with flavor in any salad and persimmons — which resemble orange tomatoes — have a spicy sweetness. Scoop out and chop their ripe flesh, or keep the skins on and slice. Keep the peels on apples and pears, too, for texture and nutrition. Tips: Don’t forget the zest! That outermost layer is packed with essential oils and flavor. A handful of no sugar-added dried fruit — like raisins, cranberries, or currants — provides chewy sweetness. Make like a squirrel and hoard those nuts and seeds. They’re nutrition powerhouses, adding minerals, fiber, protein, healthy fats to any salad. Roast pecans, walnuts, and pumpkin seeds, then toss them with salt, pepper and spices for a flavorful and crunchy topping. Tip: Nuts and seeds are calorically dense, so chop them to stretch the flavor. Roasted root veggies like beets, parsnips, and carrots — cold or straight from the oven — add sweet earthiness and depth to your salad salad. Others root vegetables like pungent daikon radish and sweet, mild jicama (peeled and added raw) can add a different kind of satisfying crunch. Tip: Roast a tray of mixed root veggies to make meal prep easier. Summer greens are tender and delicate, but winter greens are hearty and filling. Kale, tatsoi (think: Asian spinach), endive, cabbage, chard, and radicchio are all packed with nutrients like vitamins A, C, E, and K. These greens can be served raw or cooked. Tip: Toss greens with just-cooked roasted vegetables or whole grains to wilt them perfectly. Bust open your spice cabinet and boost the flavor of your salad with “warm” spices like cinnamon, ginger, turmeric, and herbs like sage, thyme, and rosemary. Sprinkle them on roasted veggies, stir into whole grains and use to season homemade salad dressing. Then add herbs, spices and other flavorings to your acid (about ½ teaspoon per two servings, but adjust to taste), then whisk in your oil and season to taste with salt and pepper. Too sour? Add a bit of maple syrup or honey. Kinda bland? Add mustard or a little more acid. A bit heavy on the spices? Double up on the acid and vinegar. You really can’t go wrong, so it’s the perfect time to play mad scientist. Turmeric-Lemon-Thyme: Massage into kale, then toss with farro, carrots, parsnips, and pomegranate arils. Lime-Ginger: Drizzle over beets and shredded red cabbage with sunflower seeds. Rosemary-Balsamic: Toss with quinoa, garlicky roasted butternut squash, radicchio, and dried cranberries. Sage-Black Pepper: Add to sautéed cremini mushrooms, red onions, roasted kabocha squash cubes, and arugula.